National University has four campuses with 4200+ students from 37 nationalities and staff members from 25 nationalities. University offers programs in academic collaboration with reputed international Universities namely Glasgow Caledonian University, UK, University of South Virginia, USA and University of South Carolina, USA and has MoUs for research collaborations with many organisations and companies in and around Oman making the University a unique multi-cultural, multi-campus, multidisciplinary campus. National University provides state-of-the-art information technology infrastructure and services to cater to all the technological needs of staff and students. Connection to free campus Wi-Fi allows access to learning management systems and the University online portal for course content, announcements, submissions and assessments. All campuses are connected with OMREN (Oman Research and Educational Network) with internet leased lines. All students and staff are provided with a University e-mail address and they are connected through the latest technology enabled platform for all academic and social activities on the campuses. Dedicated Helpdesk counters across the campuses provide onsite help for the student community. 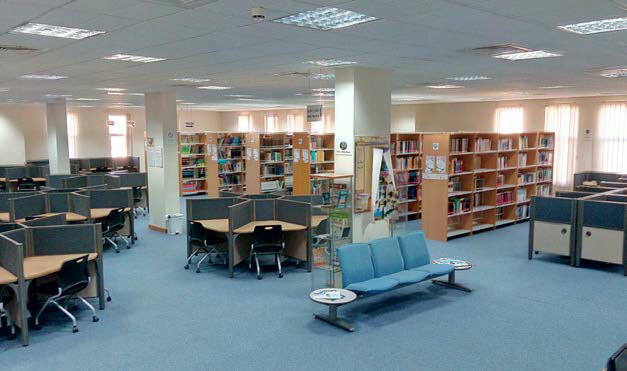 The Library and Information Services at National University provide study facilities, books loans, learning resources, e-Journals and e-Books. With an expansive range of online journal subscriptions and online books, e-learning is fundamental part of the library services, helping students with their learning and research activities both on and off campus. Common study areas, quiet study areas for individuals and group, and a Learning Resource Center (LRC) are all available. Counseling facilities are provided to support students throughout their student life on the campus. Students have access to free counseling services across all campuses. Students have the right to raise their concern on any matter, academic or non-academic, by completing the online complaint form. The right to appeal against decisions is permitted as per rules and regulations. National University encourages students to participate in sports and cultural activities. Intercollegiate sports events are organized periodically and cultural activities are promoted through various clubs which organize events such as Open Day and National Day celebrations. Facilities are available for football, basketball, cricket, table-tennis, badminton and volleyball. In addition, a comprehensive professional development program enhances soft skills by getting students involved in a wide array of student activities, societies and clubs. National University provides hostel facilities. However facilities for boy’s accommodation is limited to a few campuses. Student support services at National University, in liaison with admissions office, assigns students to accommodation during the admissions process. Transport facilities are also available. At the College of Pharmacy, a hostel facility for female students is available and is designed to be comfortable & adequate to all female students. It accommodates 142 students governed by three house mothers. It is a 4-floor building with 48 rooms. The hostel handbook has all the rules and regulations which students should strictly follow. Students who break the hostel rules are subject to disciplinary action for misconduct. Dining options on campus include canteens and cafes offering a selection of beverages as well as a variety of snacks and meals. These outlets cater to every taste, culture and dietary need and are regularly monitored and supervised by internal and external authorities for health and hygiene. Each college under National University has Student Advisory Council (SAC) operated by the students themselves to represent in various aspects of student life to enhance their learning experience. The SAC composition and remits are in accordance to the guidelines given by the MoHE in the ‘Regulatory guide of SAC at HEIs’ with the overall aim of enhancing and developing the educational/research process and services provided to students. This student-elected group offers a mechanism for identifying, discussing, and solving student related issues as well as involving students in the wider community. The Council provides a platform for expressing students’ views, talents and abilities and thereby provides An enriching experience in the college. The members of the council are professionally accountable for building, sustaining and integrating a strong and functional community that works in partnership with college management and staff, as well as with parents, for the benefit of all students. Also, the SAC platform empowers the students and enhances the student participation in the decision-making process and overall professional development of students in the college through giving opportunities, training, and practice in leadership and management activities. The SAC members meet with all representatives for identifying, discussing, and solving student related issues as well as involving students in the wider community. The council provides a platform for expressing students views, talents and abilities and thereby provides an enriching experience for the College as a whole. Over the years the council has been instrumental in enhancing various aspects of learning and teaching and the services provided by the colleges. Students are viewed as partners in various decision making processes and forums and represent themselves in college committees and boards. The council has members from various nationalities giving an opportunity for cultural exchanges especially from those from other countries. 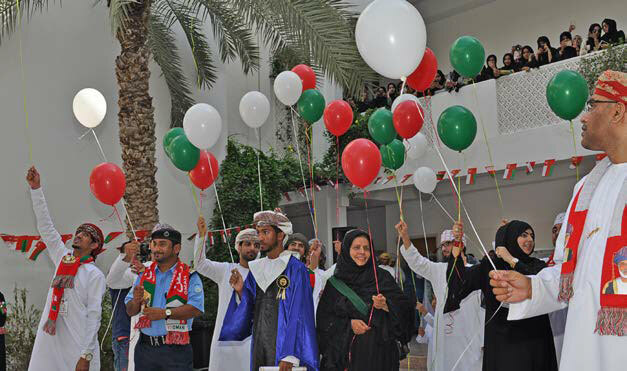 NU encourages students to take part in community activities, through registering themselves in various student’s clubs. Moreover student’s voluntary clubs often organize charity fairs and blood donation camps and proceeds are donated to recognized charitable institutions. At National University, the below mentioned clubs are established and functioning actively in order to bring out the latent potential of students. 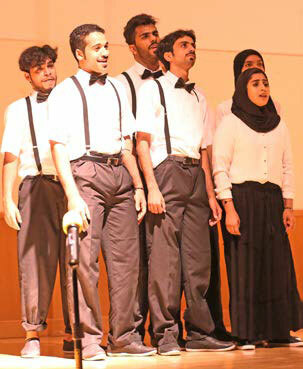 Poetry Club: Members of this club are keen and passionate in nurturing the interest and skills in Arabic poetry. Photographic Club: Photographic Club aims to encourage the passion of clicking photos in the hearts of its members and simplify the process of learning this craft. The services of these members are often used in taking snaps at the official functions and events of the University. Hiba Team: Members of this team would spread the culture of volunteerism among students, staff and targeting different groups in the community and interact with the various issues at the local, regional and global level. Drama & Cinema Club: Drama, Theater and Cinema club aims to unleash and refine the talents of students in the field of motion-film acting and developing their skills. 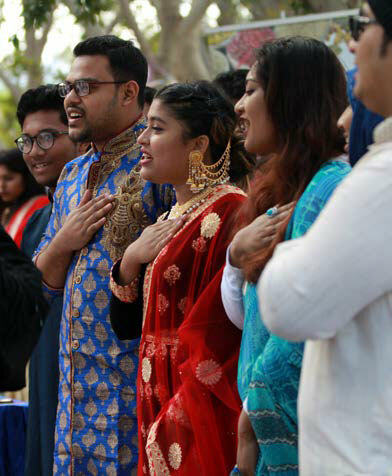 They would be able to participate in a number of competitions and theatrical festivals organised at Inter-University and Intra-University levels. Islamic Club: Student volunteers who could devote time and energy for enhancing and brightening religious faith and opulence in young minds are part of this club. Creative Makers: The very objectives of this club is raise the level of students' imaginative, aesthetic and intellectual skills in the area of fine arts focusing on a range of themes. Artal Team: This team works on raising awareness on the need of showing care, attention and love towards the elderly people and aging parents in the society/country. Electronics Hobby Club: This hobby club inspires innovative students to discover and rediscover their full potential, talent, knowledge, experience and creative ideas to satisfy the market needs. International Students: This international students club intermixes multi-culture and heritage from different countries among the student members to scale up new heights and horizons and to develop new knowledge and experience. Wellness, knowing the basics of wellness whether mental or physical can help you make healthy choices. NU cares about the Wellness of its community and provides healthy environment, counseling and recreational services. Health services are offered on-campus. This includes well equipped First Aid room with dedicated nurse on campus. First Aid Check & In patient visit anytime during working hours. Staying healthy (Emotionally, Socially, Spiritually, Intellectually, Physically) and being safe are important components to successful learning. Towards this, we offer services for your physical and mental well-being. Stay healthy. Stay safe. All NU members are responsible for ensuring the safety and security of our students treating them with honesty and respect. The health and Safety division works closely with staff Aid wardens in campus. NU is committed in contributing to human resource development through innovation, research and technological advancements in order to serve the community. The interaction and linkage with industries and professional bodies extends to human intellectual reach and is a key to Oman’s competitiveness, innovation and economic development. To make engineering education holistic and more relevant to the societal and industry needs, the students from technical institutions need to be offered training in industries to give them first hand practical exposure in addition to the theoretical themes they receive at the college. The Placement and Training Centre (PTC) aims to facilitate the process of student migration from the institution to the industry and to continue individual’s education. The PTC plays an integral part in shaping the careers of the students of the NUE and Its approach to the placement & training includes, (a) exchange of ideas and experiences with industries for the continuous improvement of the learning and teaching process by industry visits and invited talks from industry experts (b) create a professional global network for faculty, students, graduates and experts from industry and commerce (c) Career guidance and placement (d) summer training and internship. NU has been taking initiative to enhance student’s experience and providing opportunities to enrich their knowledge and experience by facilitating student’s internship during the summer with reputed institutions abroad. This includes universities in Germany, UK, France, India, USA and Australia. During every summer, NU identifies and gives opportunity for few students having good academic credentials and potential to get trained in advanced laboratories and associate with project work in their relevant field of studies abroad. NU offers limited number of scholarship facilitated by Dr PMA international internship scheme to cover travel, accommodation and subsistence, etc., and also by our affiliates, to the students having very high academic credentials. Notification of the international internship will be made annually in March and details on criteria, selection process, etc., are processed through Student Support System.